Yes, I am alive...and actually doing well. I have had lots of snags in life over the past month or so and blogging has had to take the back burner for a bit. Nothing big or serious, just more important. Really this is quite an easy and simple project. With the summer I have had, it has been started and stopped so many times, I had a difficult time finding the before and mid shots in all my photos. I think I started this in June...yea, pathetic I know. Another makeover was definitely in order. 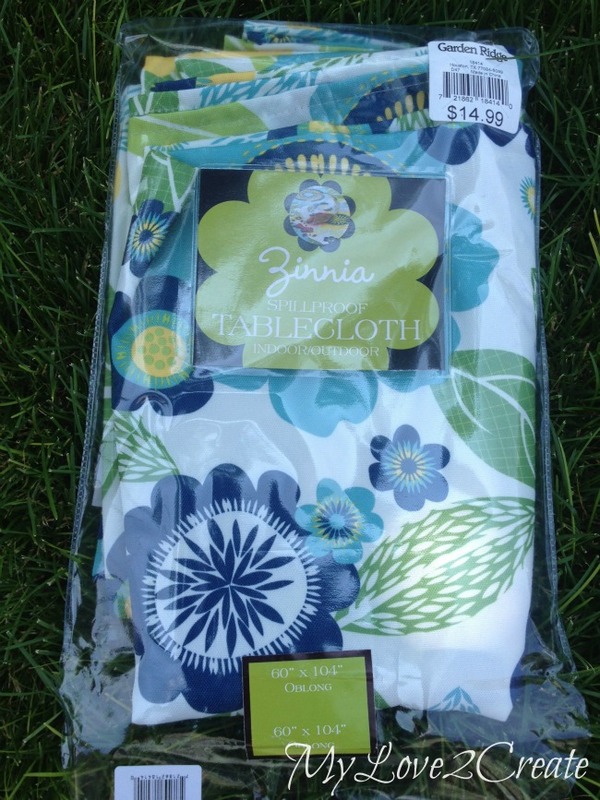 So, on a pleasure trip to "At Home" aka "Garden Ridge" (they just changed names) I spotted this super fun outdoor/indoor table cloth and I knew it would be perfect to recover the seats on my wicker furniture. This was a total splurge for me, but I felt justified because I was sure I couldn't find a great fabric for this cheap....and the colors were just what I wanted. Of course I didn't buy it right away, I went home and stewed about it for half a day before I hurried back to the store to make the purchase. Yep. Five million more. Is it against child labor laws to pay your 10 year old a dollar to help you remove staples? 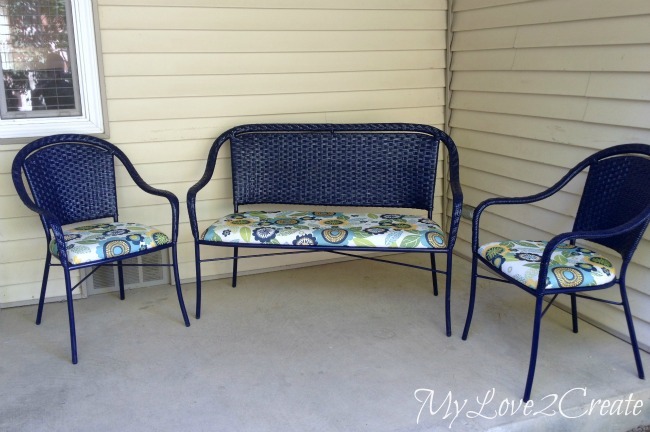 I decided that a nice navy blue spray paint on the wicker and metal would be perfect to match the newly recovered seats. 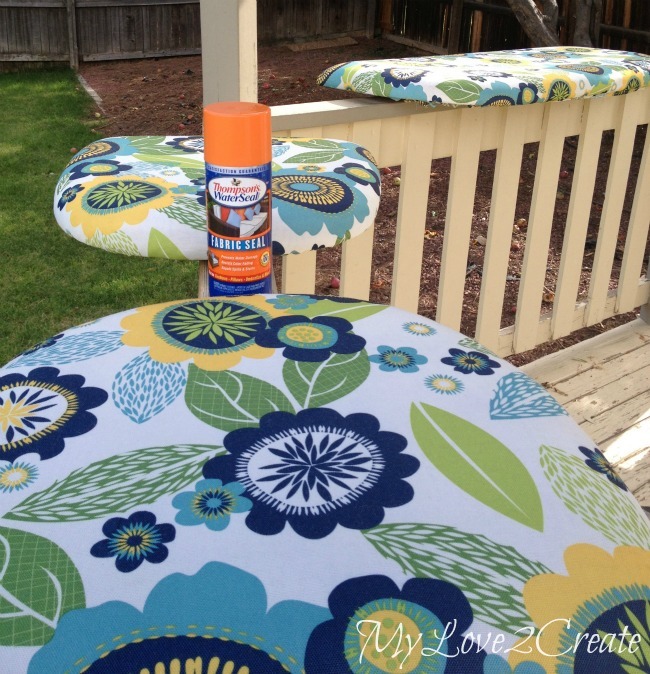 I made sure to wipe them clean and then used not quite three cans to spray all three chairs. 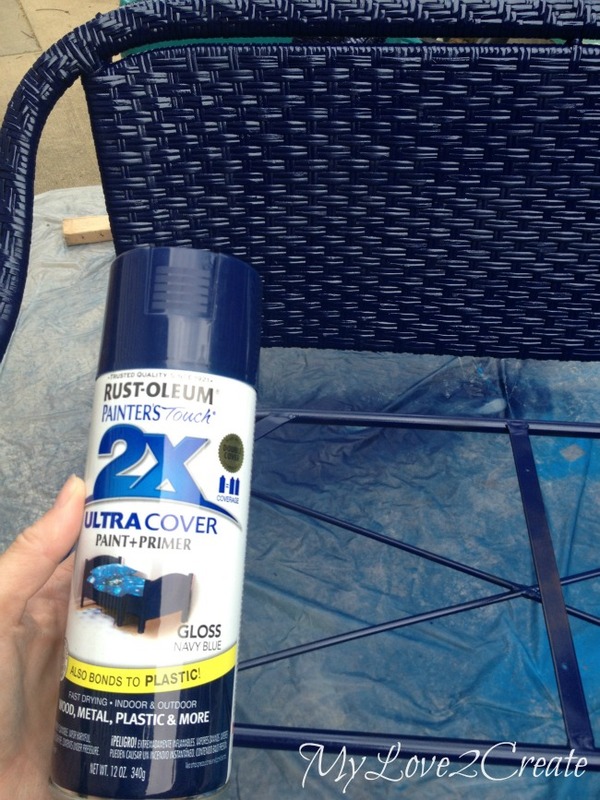 I love Rust-oleum's spray paint, seriously it hasn't failed me yet!! Great coverage and easy to spray, I get it at Home Depot. I set my seats on the tablecloth and cut the fabric a few inches bigger on all sides, I made sure to pull it up to check if I had enough fabric. This is obviously outdoor furniture, and the weather must be dealt with. 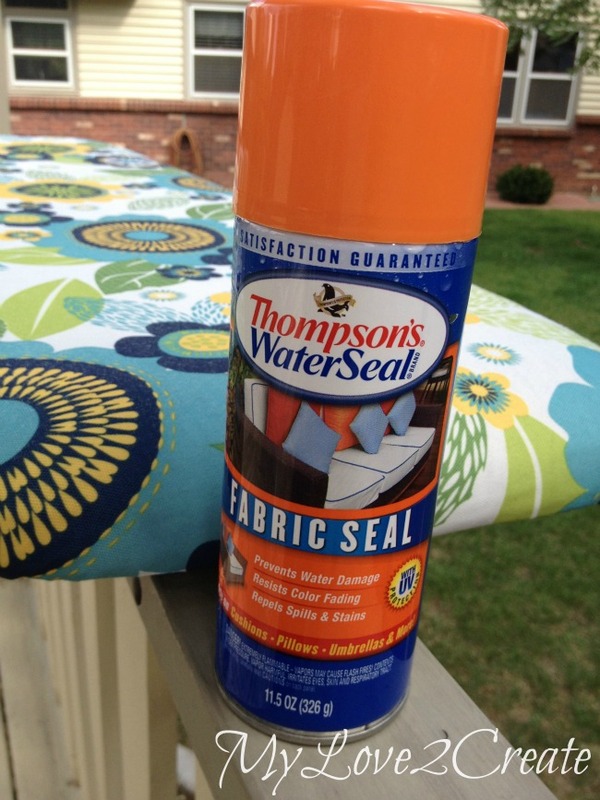 I have been wanting to try this Thompson's Water Seal Fabric Seal for SOOOOO long. Since June to be exact. I was so impressed with this product when I saw it at the Thompson's Booth at SNAP in March that I was giddy with excitement when they sent me some to try!! I sprayed it on and recoated after 4 hours. Super simple! Not only does it waterproof the fabric, it resists color fading, and repels stains, a total must with 6 kids and a dog. 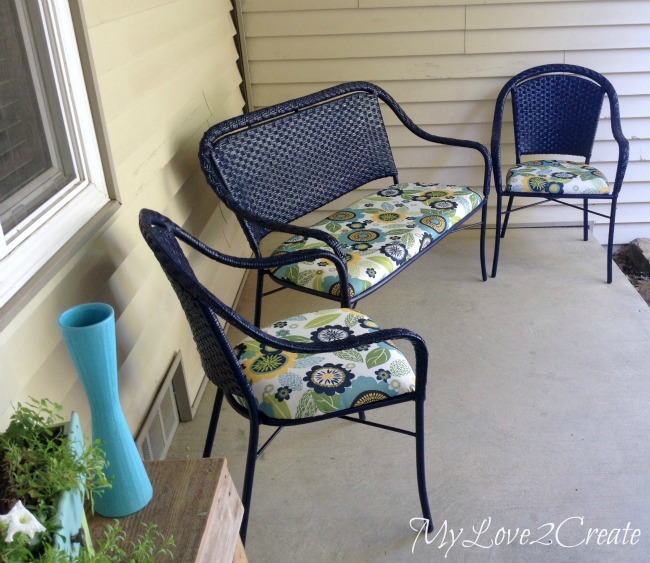 It was really quick and easy to apply, and I am now itching to make some outdoor pillows to spray it on! 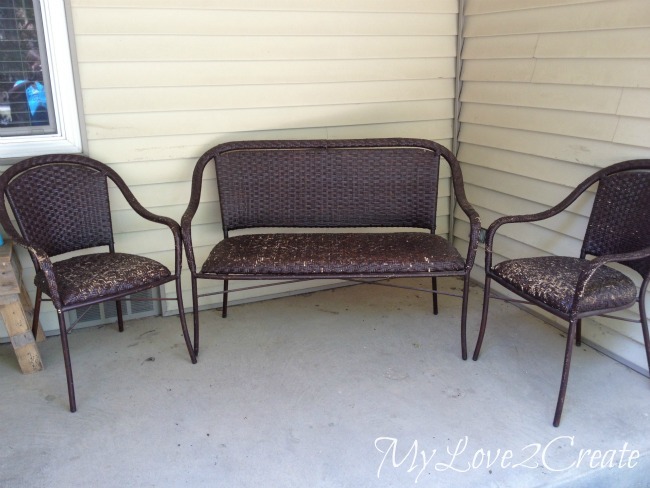 I reattached the seats aaannd....TA DA...a super cute wicker furniture makeover for less than $30! It is so fun, bright and inviting! It will stay here on my front porch for a little while, maybe until next spring. 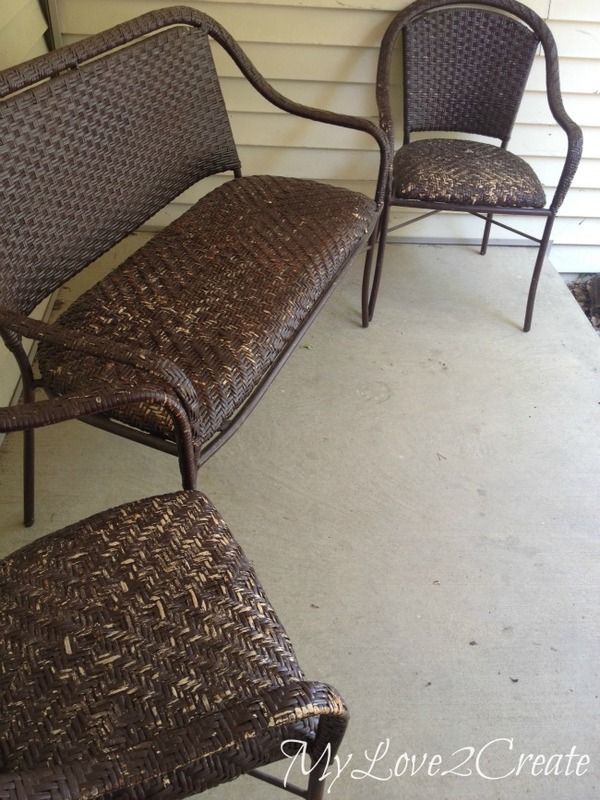 This set was supposed to go on my finished back porch that....isn't finished. Ahhh, the best laid plans....maybe next summer won't be as busy? Ha ha ha! 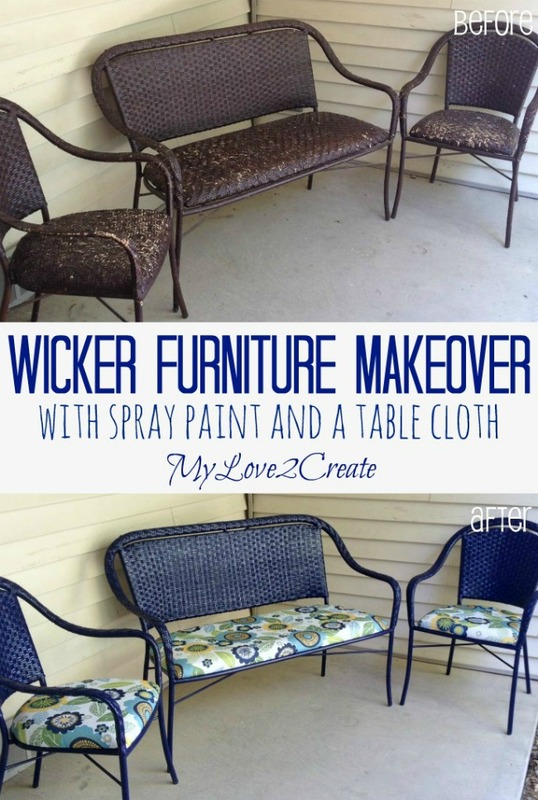 Do you have any wicker furniture that needs sprucing up? I totally recommend just going for it, you won't be sorry! 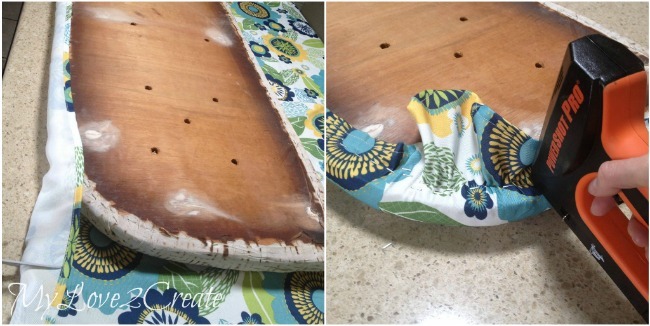 *Update: I ended up redoing these again two years later...just a little refresh...Ok, I found a new tablecloth and I loved the fabric, so I couldn't resist! ;) check them out in my Long Porch Planters post. Mindi, I completely understand about life snags. These past four weeks have been crazy. I meant to post today, but could not. Hopefully, Wednesday. My blog had to take a back seat (again) so I could focus on other stuff that really needed my attention. Wow, this transformation is amazing! 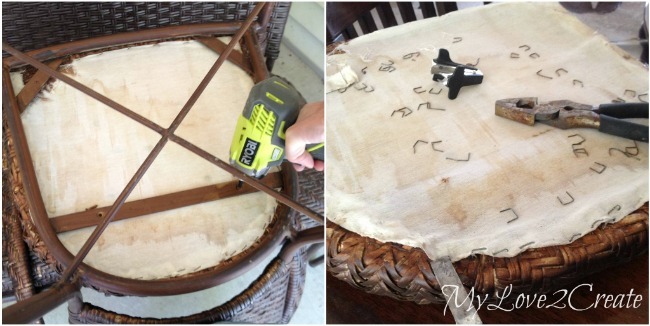 Genius to use a table cloth as your seat fabric! I co-host a link party that opened tomorrow (wed) at 8:00 pm EST and I'd love for you to stop by and share this great post! www.4you-withlove.com Here's to a great day! I so enjoy seeing before and after pictures of a project, especially when the results are so amazing. Wonderful job on you patio project. This looks GREAT! I have been wanting to try that water seal spray myself so I think when I move, I will do something similar to this. Great job! Fantastic transformation!!! Thanks for linking it up to Monday Funday! wow what a huge difference! 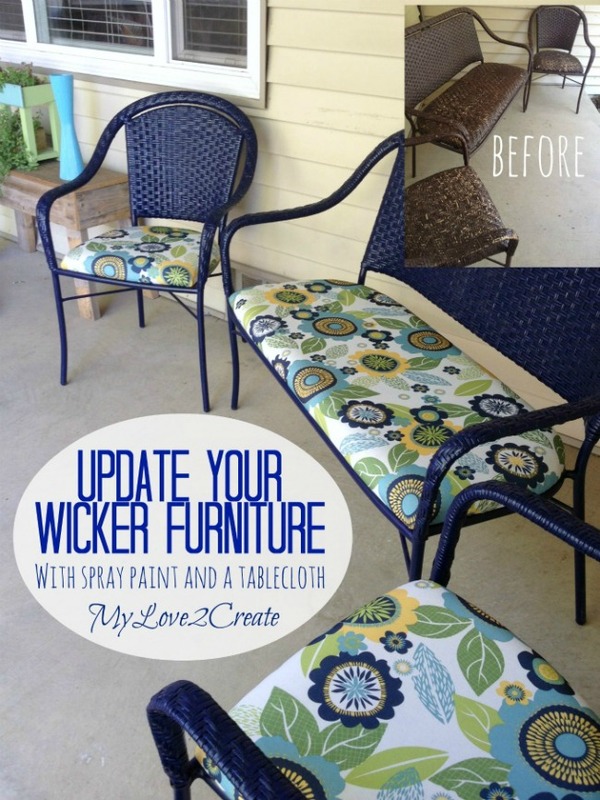 I love the finished redo wicker furniture! 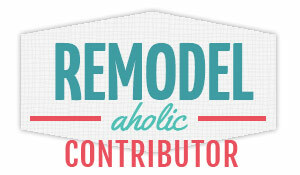 thanks for sharing the diy, hints, tips, etc. appreciate it! Beautiful makeover Mindi!!!! Great save! That looks awesome! Such a great transformation...it looks totally new. Thanks for sharing on Merry Monday. I love projects like this. Well that is a great make-over, great job with the fabric choice. 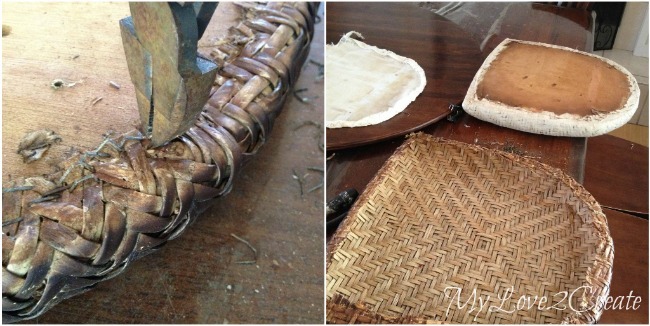 I have an upholstery post today too, if I didn't know better I say its the same. I bought my fabric at Joanne's but it sure does look like a similar pattern. Very cute transformation! Thanks for linking! Oh wow, what a transformation! I would never have guessed the after came from the before. Well done! Amazing! love the fabric and the look! Wow! 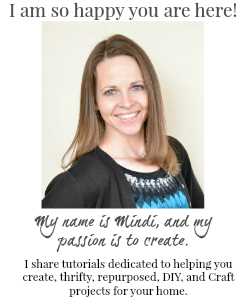 Mindi this turned out great! When I was there last summer you were wanting to do this make-over. You are amazing, I am so proud of you. I know it is pathetic that I am just now seeing this...part of that "life snags" stuff!